Usually when you have goblins they are a nuisance at best. Not so when you have this variety of fantasy creature! 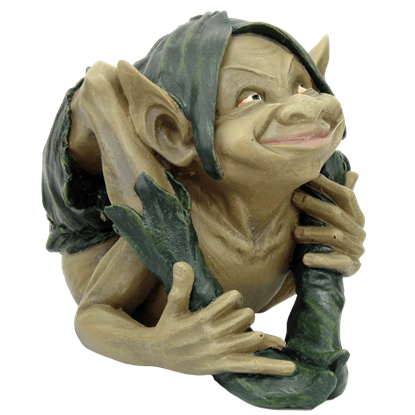 Instead of being malicious or unwanted, this Flexible Garden Goblin Statue brings a bit of levity and fun to any room! Some sources of fantasy paint goblins as cruel and capricious. In regards to this Garden Goblin and Frog Statue, that description is hardly true. A better way to label this fantasy creature is to call it fun-loving or even mischievous! What do you get when you give a goblin a slingshot? Aside from mischief aplenty, you also get a fun statue! 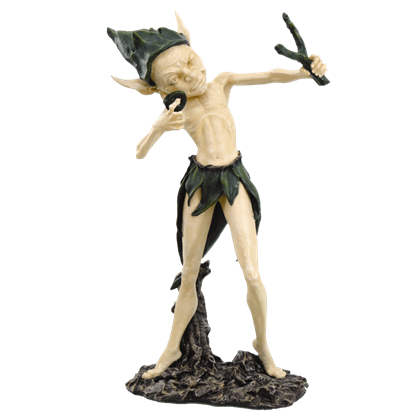 This Garden Goblin with Slingshot Statue lets you bring a fun and lighthearted denizen of fantasy into your homes decor. Garden gnomes like to make the most out of their days. They do their daily chores first thing in the morning, and then they go and play! 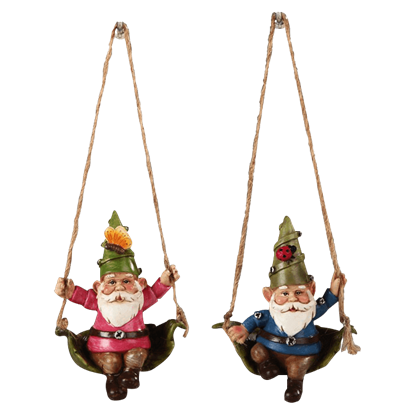 The two gnomes in the Gnome Ornament Set like to swing on swings made from leaves and string. There is something about garden gnomes that seem to pull together any outdoor garden or lawn. It could be their chubby bodies, or maybe it is the look on their faces that says howdy neighbor, as seen on the gnomes of the Gnome Set! The maxim of the three wise monkeys is one that everyone knows or at least recognizes on sight. 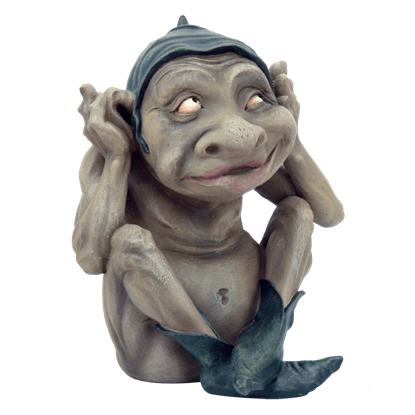 That age old notion is given a new twist in this Hear No Evil Goblin, which recreates part of the trio in this mischievous house goblin. 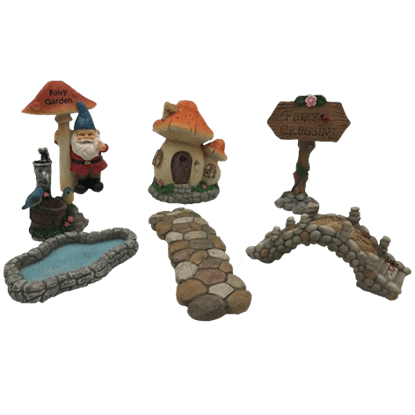 Sprinkle some magic into your life with our Mini Gnome and Fairy Garden Set. 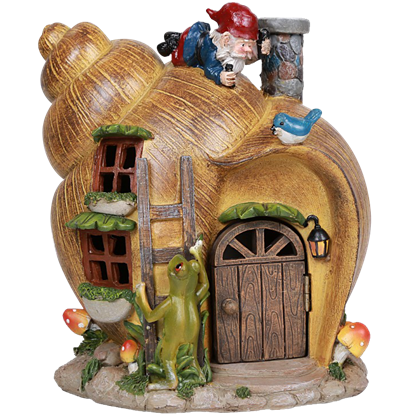 This collection of decor pieces features fairytale staples like gnomes, fairy signs, and mushroom houses as well as a bridge and pond and bird feeder. While garden gnomes have had a reputation as mischievous, they are truly harmless. 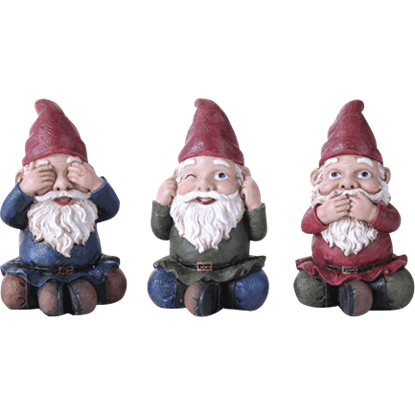 In fact, as this No Evil Gnomes 3 Piece Set shows, some of them want nothing more than to help you make good decisions and think nice thoughts! 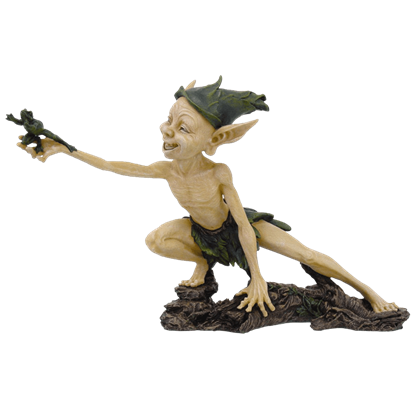 In a fun twist from the norm, this Playful Garden Goblin Statue is one fantasy monster that you will want in your house! 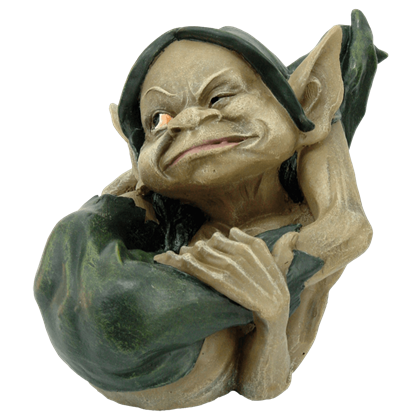 Far from malign, this statue instead depicts a playful goblin sprite that is sure to bring a smile to your face! 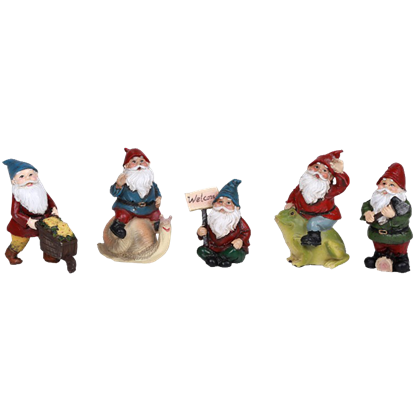 Depicted in actions ranging from industrious to playful, these little gnomes are utterly charming wherever they decorate. 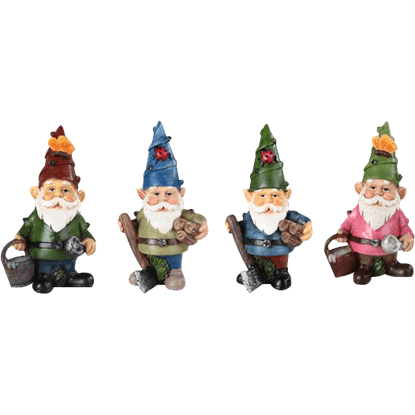 This Set of 5 Mini Gnome Statues includes five different gnomes, each painted by hand and made of cast resin. The Snail Shell Gnome Home is a welcome place indeed, with a frog and bird come to visit the gnome resident. This fantasy house statue is hand painted in rich, beautiful colors and made of cast resin for a great level of detail. The maxim of the three wise monkeys is one that everyone knows or at least recognizes on sight. 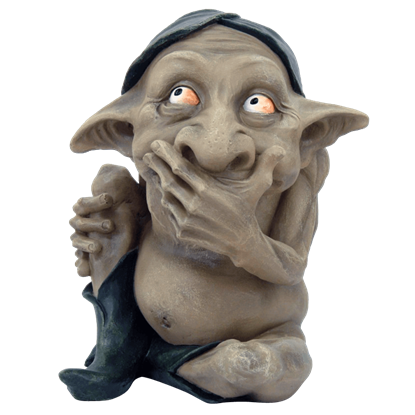 That age old notion is given a new twist in this Speak No Evil Goblin, which recreates part of the trio in this mischievous house goblin.